F.L.Y put the spotlight on local and up and coming people who’s trying to get their clothing or apparel brands known. It’s geared towards more the clean and upscale urban wear. The design brands will have their models and business affiliates educating the party goers on their apparel. “NOT A FASHION SHOW”. They’ll, have some for sell also. Hence, What’s make you F.L.Y? Music BY DJ BYRD and more! Guest list includes: “Open Bar til 11pm and Free entry til 11pm”. To add names to out guest list send them to 904.207.8676 before August 12th at 6pm. For VIP INFO text John Sloan 904.616.5323. DOORS OPEN AT 9PM. It’s giving a chance for local talented and creative individuals in Duval, to get their name known in the city. The dresscode will be still clean but on the urban upscale end. Giving people chance to show off their Gucci or Versace designer shirts and other hi-end design brands. 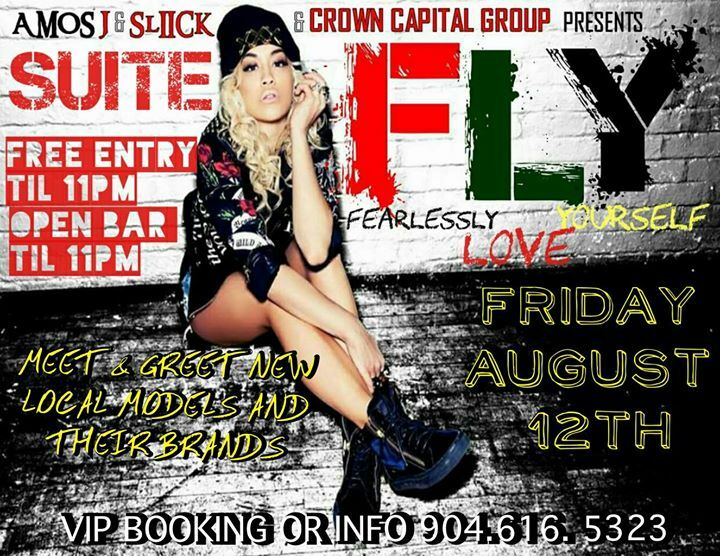 F.L.Y AUGUST 12TH AT SUITE DRESSCODE: LADIES: No Flats, No None designer shoes, No sandals, No snow boots. Wear heels with skirt,jeans,shorts,dress or dress shorts or business pants.Upscale relaxed. MEN: No athletic sneakers, No sandles, No shorts, No sports hats, No plain or none designer Tees, Wear Polo styled button shirt, Wear designer shirts, Wear button down with hard bottom shoes, boots, or designer shoes with fitted jeans or dress pants. Can wear designer high-end hats. George Acosta Returns to Suite!